General Fishing Laws apply to all inland waters. See General Fishing Laws. Check if the water you want to fish is listed in the alphabetical Special Fishing Laws. If water is listed - Any exceptions to the General Laws will be designated by text or Special Season or Law Codes. If water is not listed - Only General Fishing Laws apply. Unlisted Tribal Waters located in Passamaquoddy or Penobscot Indian Territory are an exception. See Tribal Water Laws. Some waters (tributaries, outlets, connected waters) are not listed individually and may be listed with the main waterbody, or waters with an S-3 code (tributaries closed to taking smelts). Some waters are collectively listed under one of the following area listings: Allagash Wilderness Waterway, Baxter State Park. 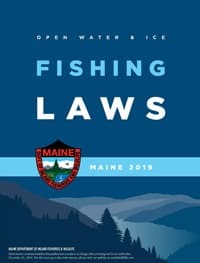 If you would like to receive an official copy of the 2019 Maine Open Water and Ice Fishing Laws by mail, please send your request by email or call us at (207) 287-8000.